Jan Preston: “: Life is for learning! Jan Preston has kept the flame of boogie-woogie alive, and by ‘flame’ we mean that her playing is sizzling hot. 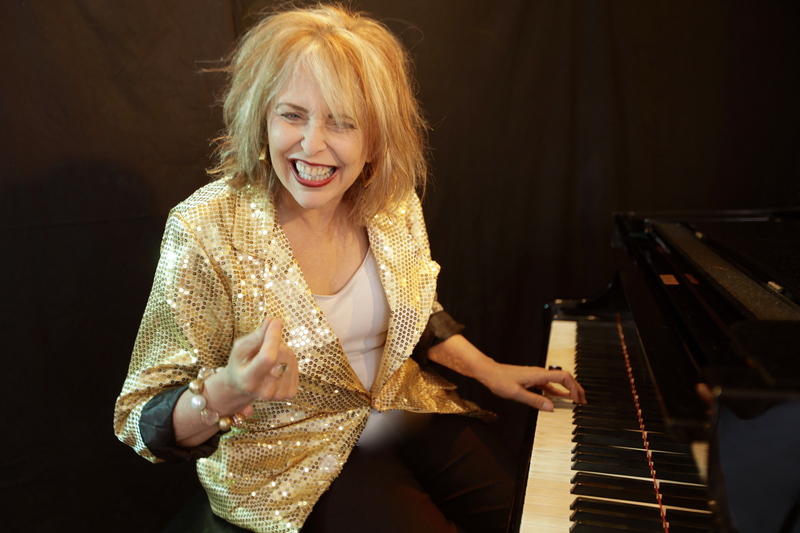 A high-energy pianist with a take-no-prisoners attitude, she’s currently presenting ‘Adventures in Pianoland’, a one-woman show in which she narrates her journey from concert pianist to impromptu pop hit-maker to queen of the blues-boogie-woogie-ragtime-jazz idiom. Anyone near Canberra shouldn’t miss it. AustralianJazz.Net: Where is ‘Pianoland’? How can anyone get there? Jan Preston: Anyone who plays piano every day can get to Pianoland. AJN: How did you get there? JP: I started out as a very serious classical pianist, a five- year music degree in performance of classical piano. I was always interested in boogie and ragtime, but didn’t have a teacher for that style, so I taught myself, with great difficulty, later in life. I regret I didn’t live in Hamburg during the 1970s, when there was the huge explosion of boogie and blues piano players, the best in the world. It would have been clearer and quicker for me if I could have been part of that scene. AJN: Why did you turn to boogie woogie? JP: Every musician has a range of styles they can perfect and investigate. It seems that boogie is the style that suits my personality best, that turns me on the most so I have been drawn to it. I feel enlivened when I play and sing, but I still love playing Chopin and Bach as well. JP: German Axel Zwingenberger, widely considered to be the greatest boogie piano player in the world. AJN: What should those who come to your shows at The Street expect? What are you expecting from them? JP: My audiences always expect to be entertained and engrossed, and this show is no different. It being autobiographical, I perhaps reveal more of myself than in my normal boogie concerts. AJN: Which part of your personality/ history has yet to find its way to your playing? JP: Life is for learning! As a musician my investigation of piano playing, composing and songwriting is ever unfolding. AJN: What keeps you going? JP: The music keeps me going, definitely! But, of course, my husband and son are a very big part of my off-stage life. AJN: If you could summon anyone’s spirit to come and join you for a duet, who would that be? JP: Songwriter and piano player extraordinaire, Anne Rabson. Anne wasn’t well known but has been a great inspiration to me. And of course I’d love to play along with Winifred Attwell! AJN: What is the first thing that comes to mind, whenever you listen to ‘Dr. I like your medicine‘? JP: What were the chords!? JP: My Room of Pianos, an original song about how I love to play the piano. *Jan Preston will perform ‘Adventures in Pianoland’ at The Street, from Thursday 11 August to Sunday 14 August.